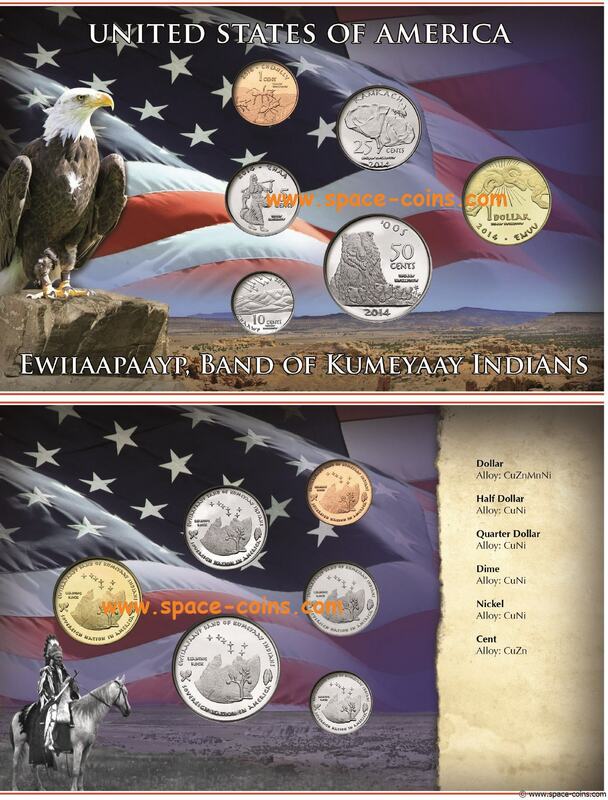 Indian Tribe, Ewiiaapaayp, 2014, full set! 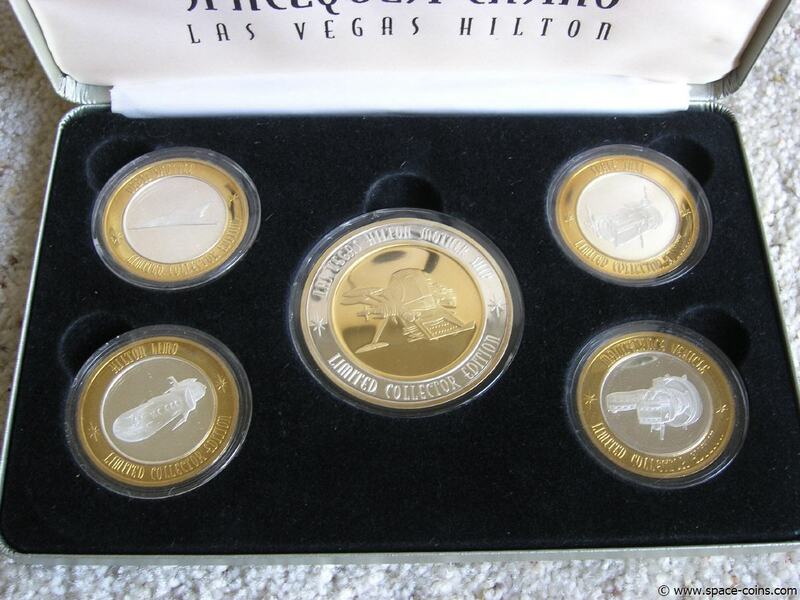 Conquest of Space, 9 silver medals - only 500 made! 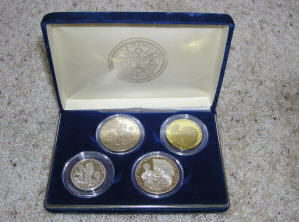 The complete set! 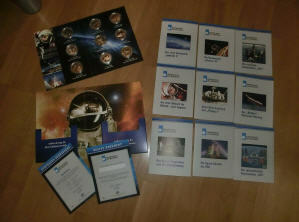 Including all original paperwork, description cards and certificate! 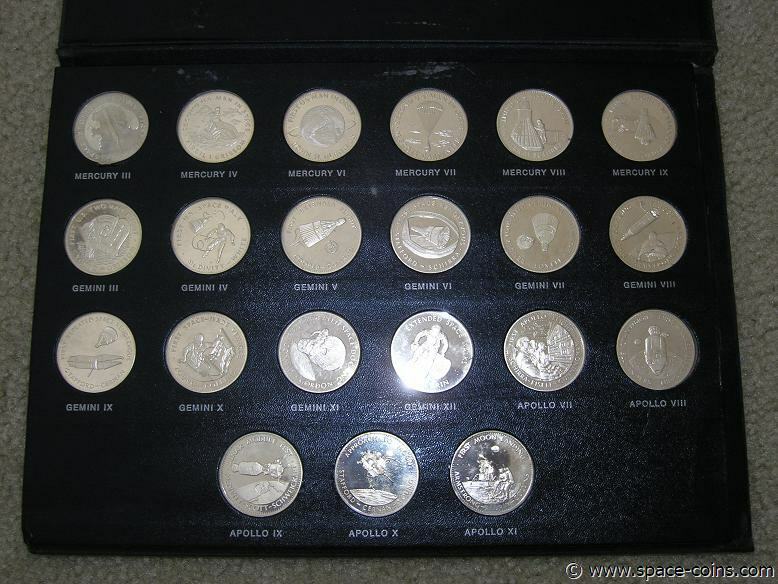 All 9 medals have the same serial number! 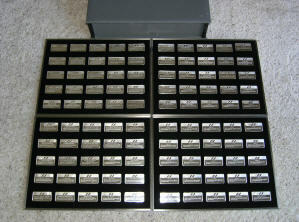 100 Silver Bars/Ingots - 93 troy oz Sterling Silver!! 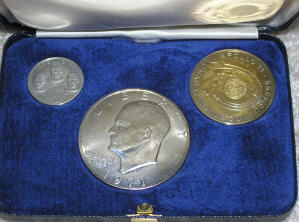 Size: approximately 2 1/8" x 1 1/8"
Weight: Each one weights .93 troy oz (29grams) for a total weight of 93 troy oz (2,900 grams)! 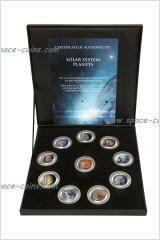 21 Silver Medals -Men in Space- 14.7 Oz, Special Edition! 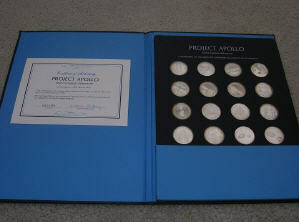 This is the SPECIAL MINT EDITION!! V E R Y rare! 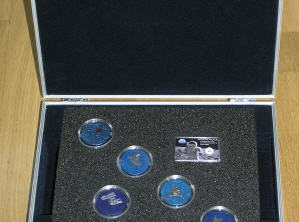 A set of 21 Sterling (.925 pure) Silver Proof Medals depicting major events in the early years of the NASA Space Program. 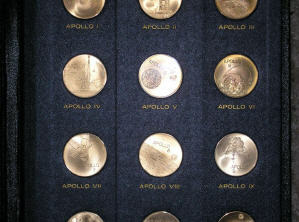 Each medal is 1 3/8 inch in diameter and weighs 0.7 ounces (total weight of the medals is about 15 ounces). 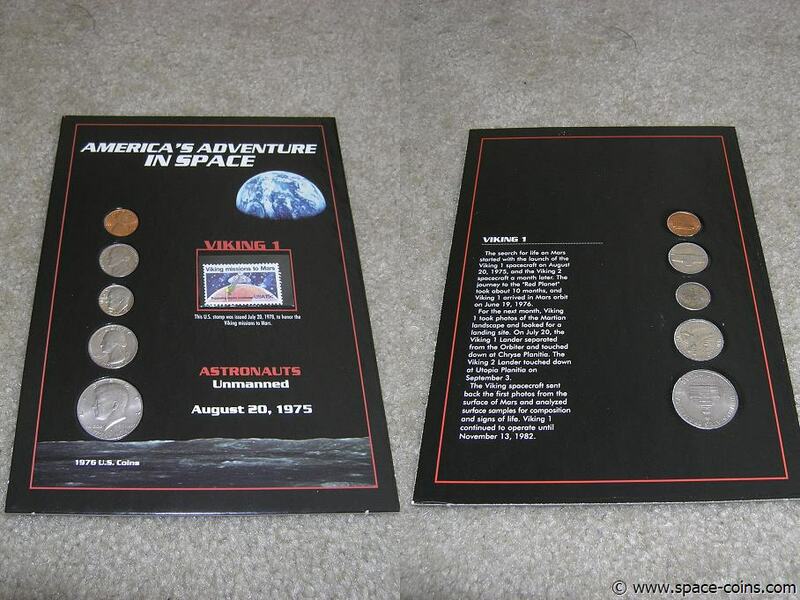 First U.S. Man in Space - Alan B. Shepard Jr.
First U.S. Man in Orbit - John Glenn Jr.
First U.S. Long Flight - L. Gordon Cooper Jr.
A set of 21 Sterling (.925 pure) Silver Proof Medals depicting major events in the early years of the NASA Space Program. 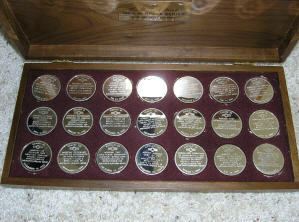 Each medal is 1 3/8 inch in diameter and weighs 0.7 ounces (total weight of the medals is 14.7 ounces). 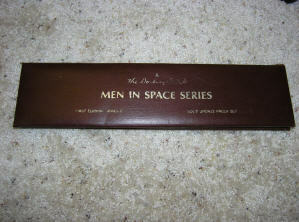 Men In Space Series 2 !! 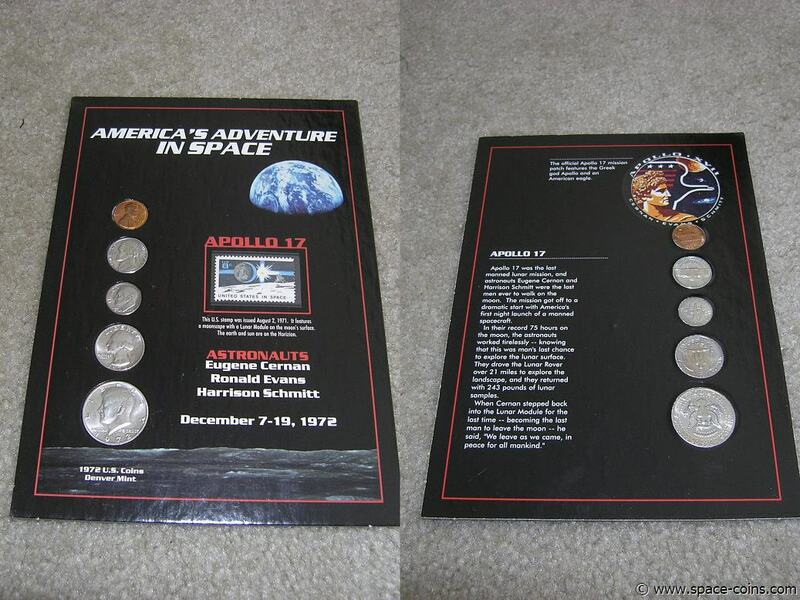 Man in Space, Apollo 12 - 17, Silver Proof, SERIES 2 !! These six medals are not part of the "original" Man in Space Series. 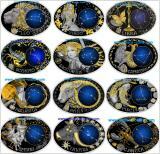 They are the COMPLETE "Series 2"!! Very rare!! 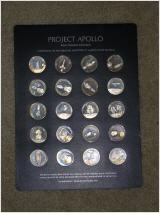 A set of 21 Medals depicting major events in the early years of the NASA Space Program - complete! 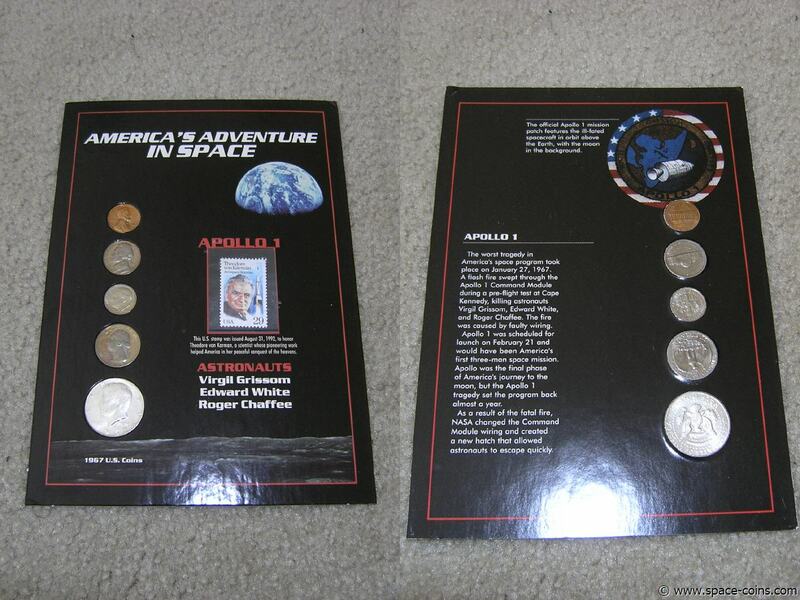 Man in Space, Apollo 12 - 17, bronze, SERIES 2 !! 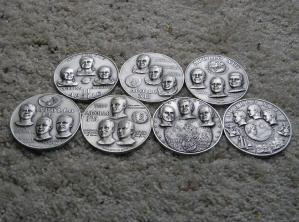 In their original Album (has some damage/wear)! 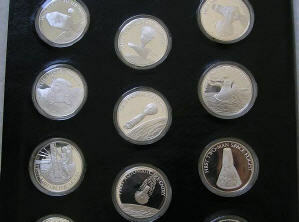 Limited Edition Solid Sterling Silver 31mm diameter (it contains 9 troy ounces of silver). 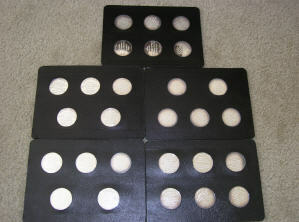 A total of only 4967 sets were issued. 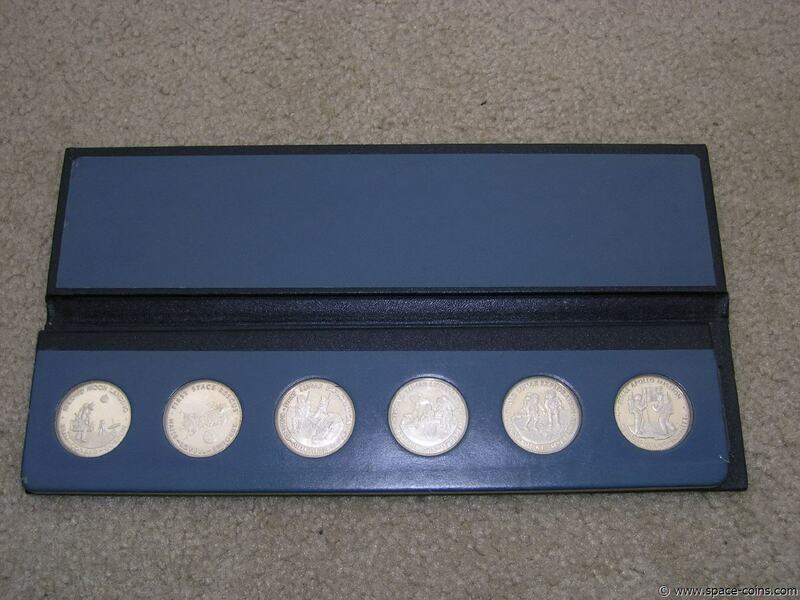 Comes in a navy blue binder with "The Franklin Mint" embossed on the front cover. 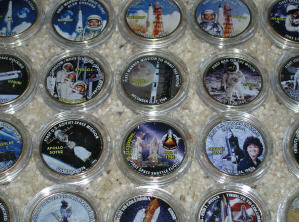 24 different $50 1oz pure silver coins SPACE EXPLORATION !! 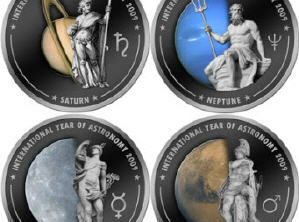 4 different coins, Marshall Islands, First Man On The Moon! 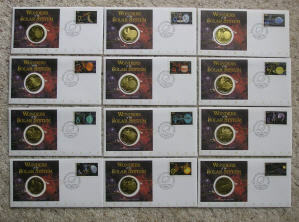 The complete set "Wonders Of The Solar System"
The issue was limited to a total of 5,000! 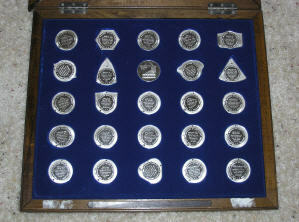 Housed in a presentation case with certificate of authenticity. 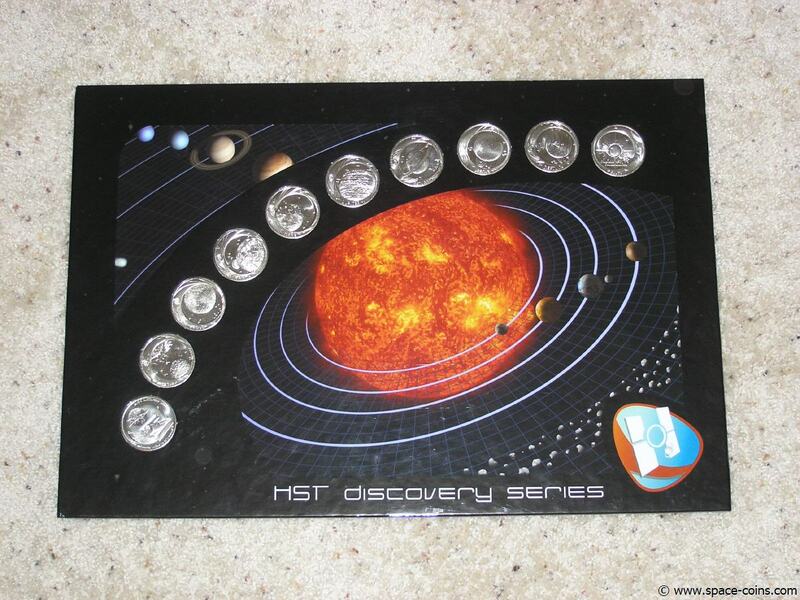 10 Cook Islands coins that serve as host for the planets of our solar system (including pluto and the sun)! 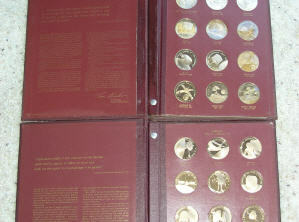 Mintage - only 5000 sets! 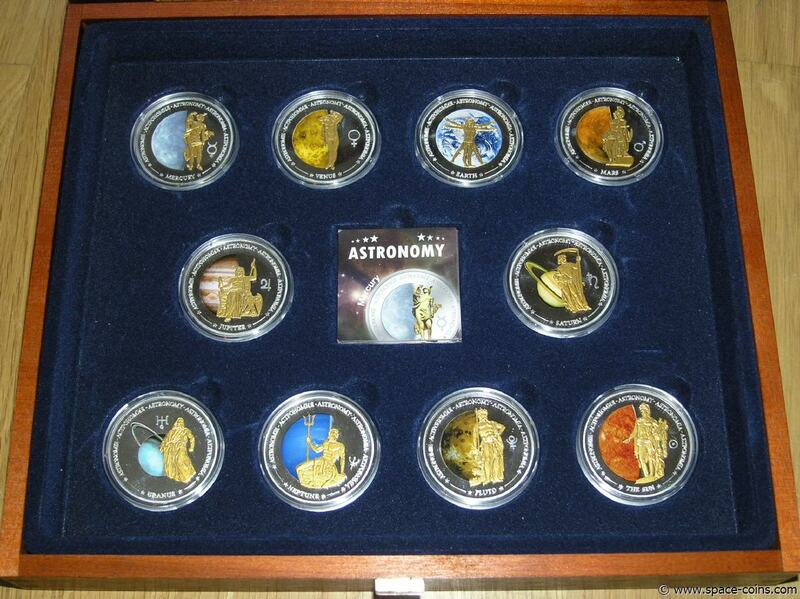 Astronomy 10 piece coin set! 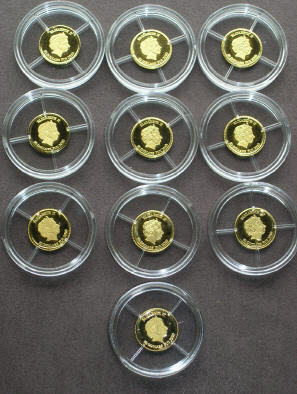 With COAs for each of the ten coins! 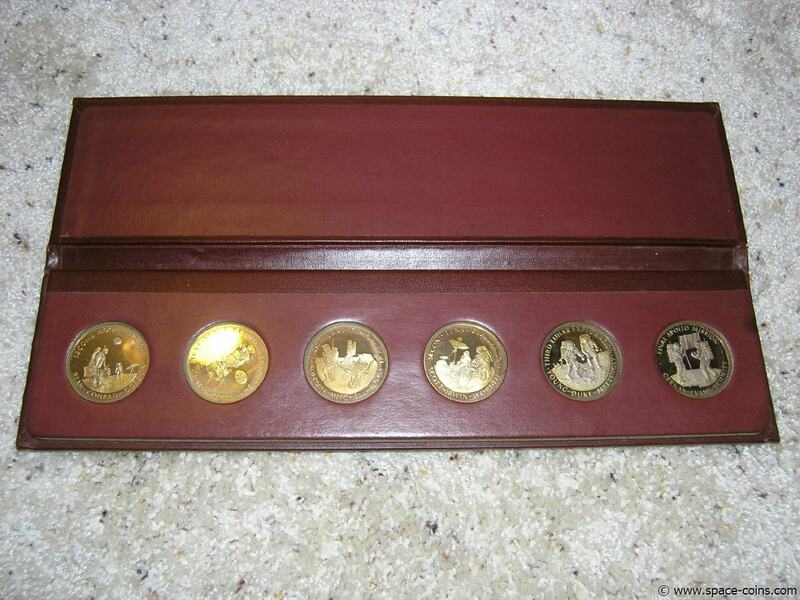 Including the original wooden box and COAs for each of the ten coins! 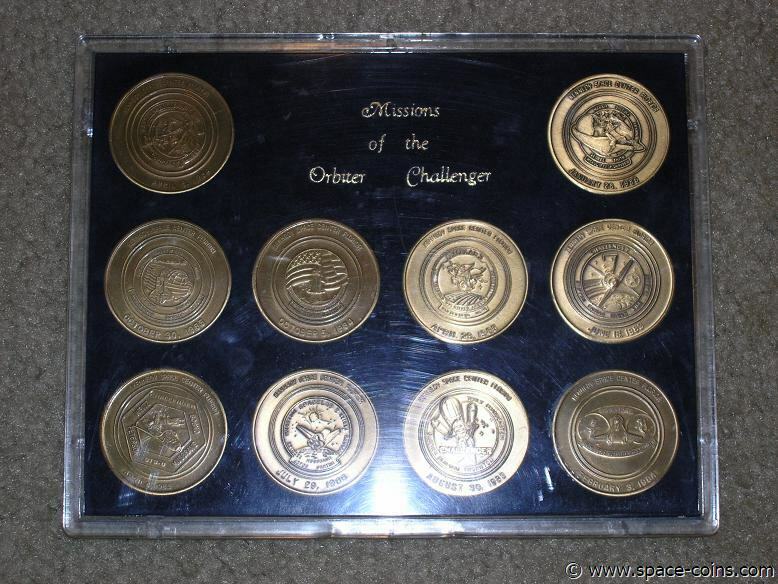 With COAs for each of the nine coins! 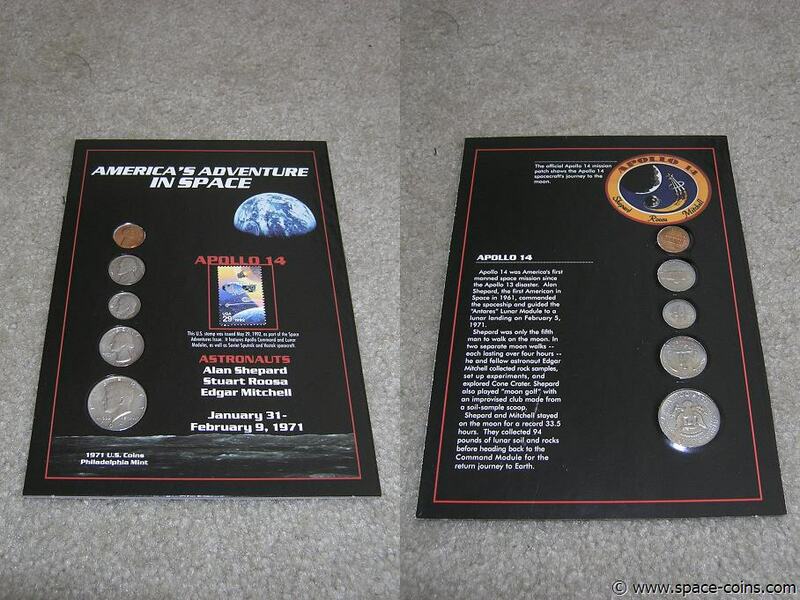 25 Space flight Anniversary Medals! 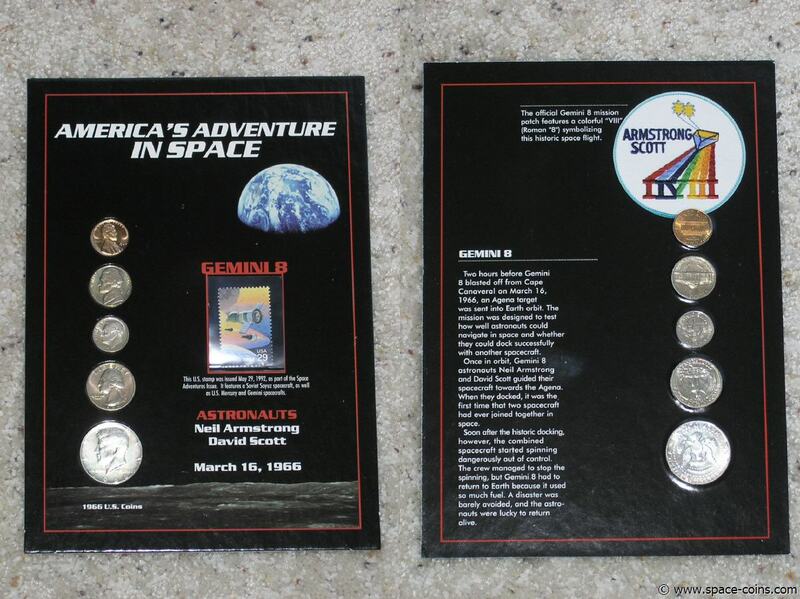 25 SILVER medals, Space flight Anniversary Medals! 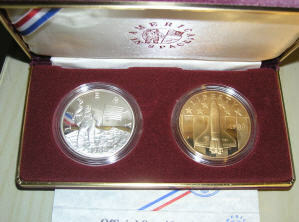 "The Official American Space Flight Silver Anniversary Medals" ! 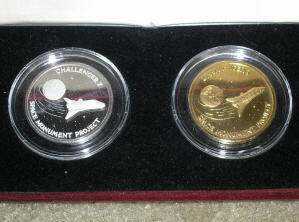 A set of 25 Sterling (.925 pure) Silver Proof Medals depicting major events in the Space Program. 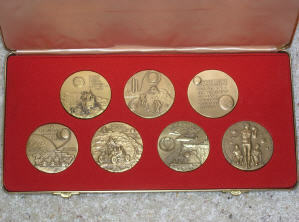 Each medal is about 1 1/2 inch in diameter and weighs about 0.85 ounces on my scale (total weight of the medals is over 21 ounces!). 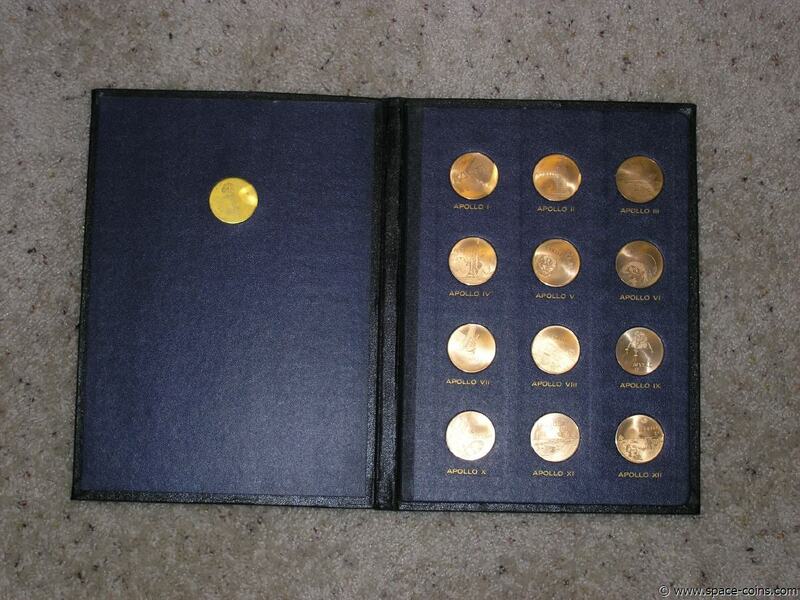 They come in a black hard cover album- each medal in its own capsule and with certificate of authenticity and 25 description cards for each medal in the back of the album. The blax storage box shows signs of age/use! 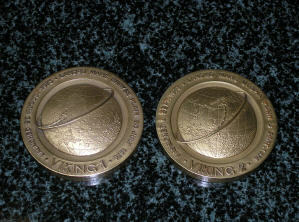 Those medals were struck in the shape of the missions they depict! 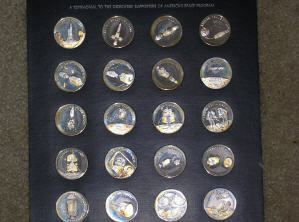 A set of 25 Sterling (.925 pure) Silver Proof Medals depicting major events in the early years of the NASA Space Program. 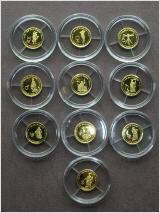 The round medals are about 1.5'' in diameter and all medals weighs 0.7 ounces each (total weight of the medals is about 17.5 ounces). 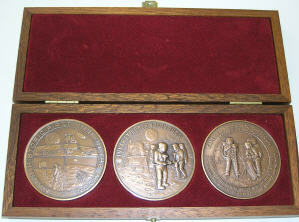 In their original wood frame. Including paperwork! 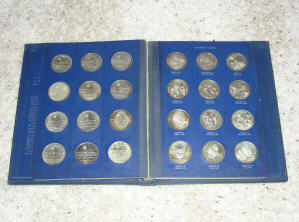 60 medals! 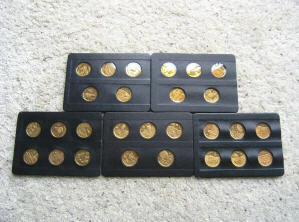 The complete Set!! 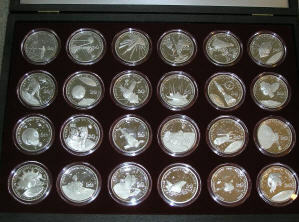 60 different 0.9 oz sterling silver medals! 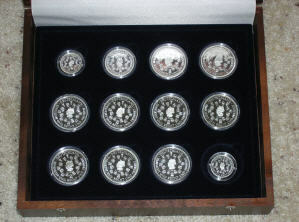 24 different 0.9 oz sterling silver medals! 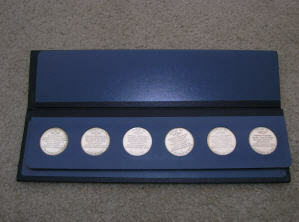 In a 10.75” x 8.75” x 1” blue leather notebook. 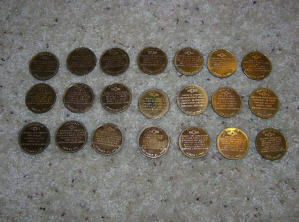 60 different 0.9 oz bronze medals! 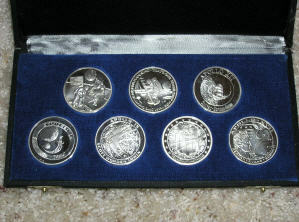 The complete Set!! In two red 10.75” x 8.75” x 1” leather notebooks. 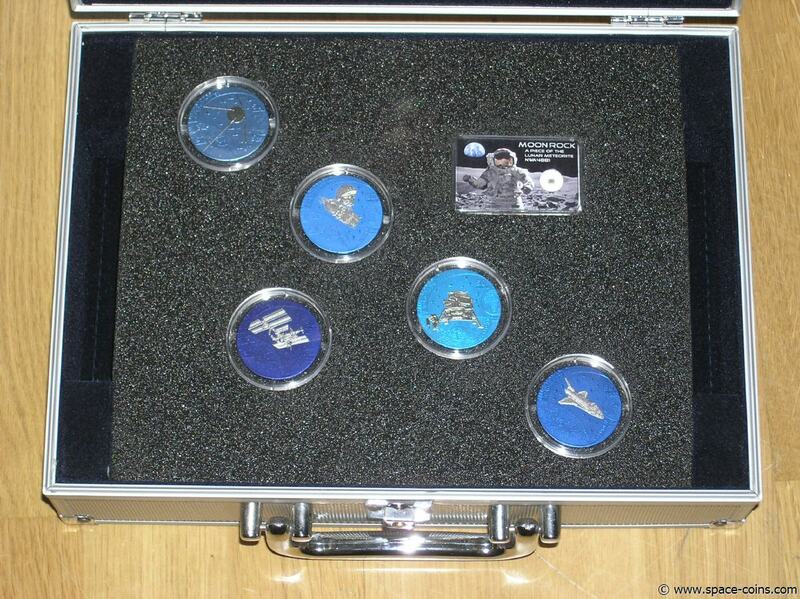 COMPLETE America in Space sterling silver mini-coin collection offered by the Franklin Mint on the occasion of the fifteenth anniversary of America's first manned orbit of earth. 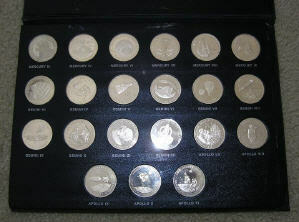 All of these silver mini coins are in outstanding shape! 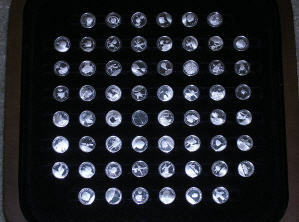 The are very shiny! 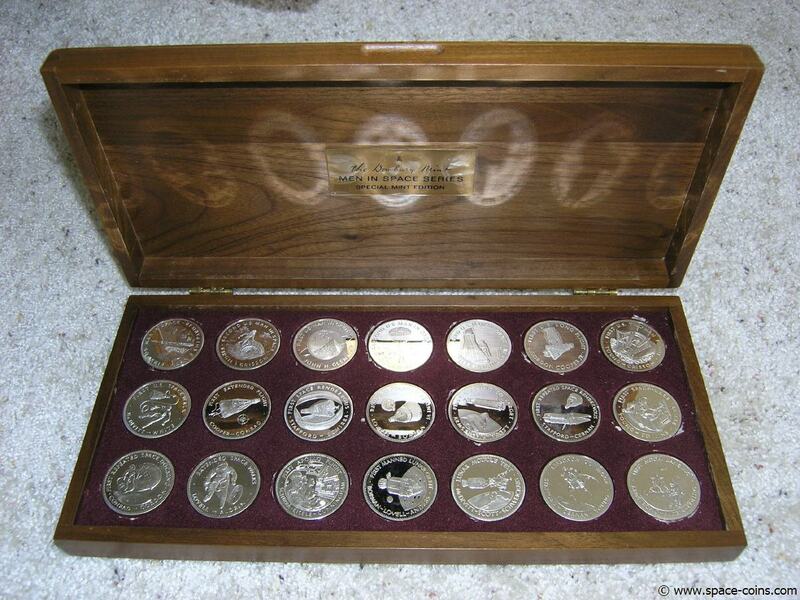 This collection has 60 (all different!) 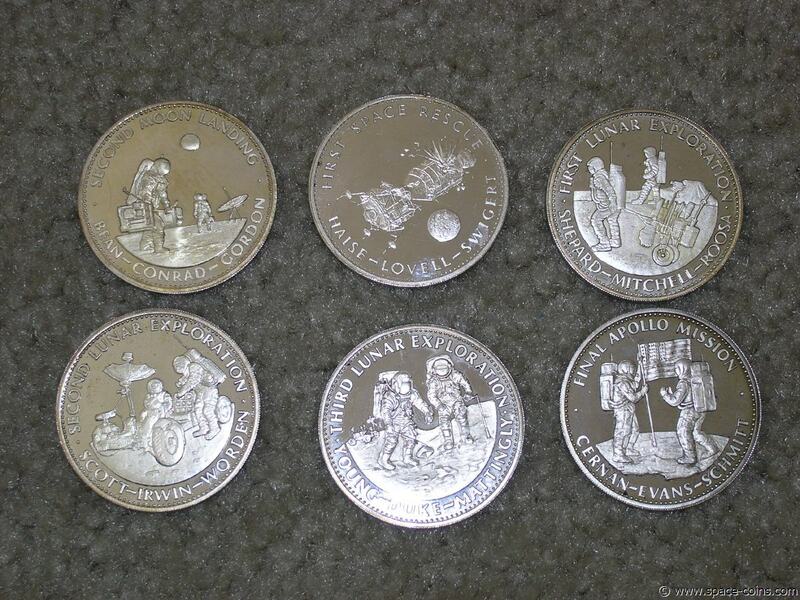 small sterling silver coins commemorating the space race. 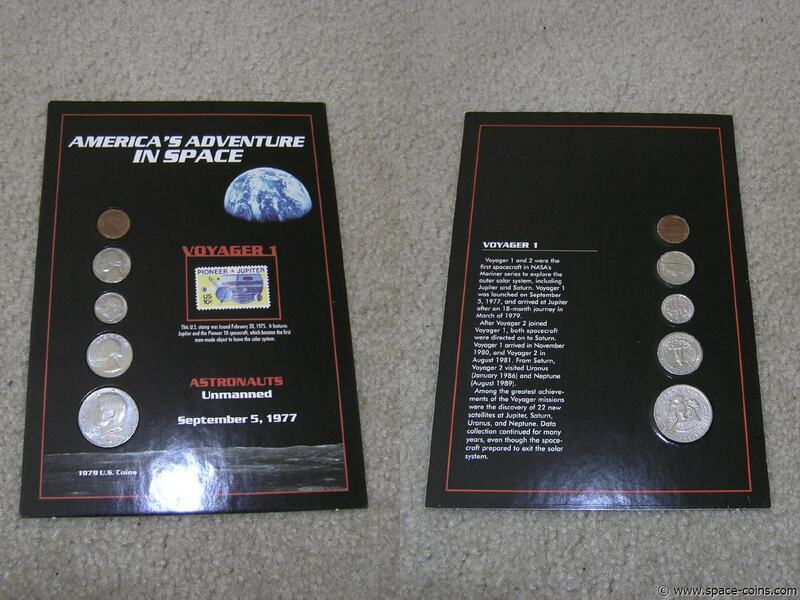 Those coins are in any way exactly like the larger ones usually offered in those two blue "America In Space" Albums, only those mini coins are smaler (they are about 12mm in diameter each, about 0.5 inch). 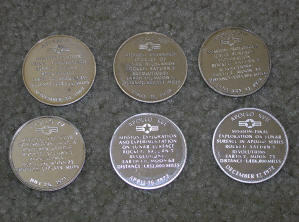 Issued by the Medallic Art Co., Danbury, CT.
Large medals, 2-1/2" in diameter and 3/16" thick. 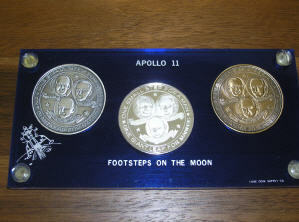 The medals have a relief portraits of the astronauts, the dates of the mission and the official emblem and other relief pictures. 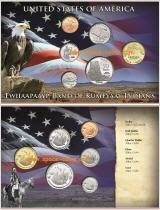 THE COMPLETE SET- only 5,000 issued! 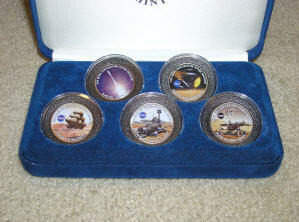 The medals have MATCHING serial numbers! 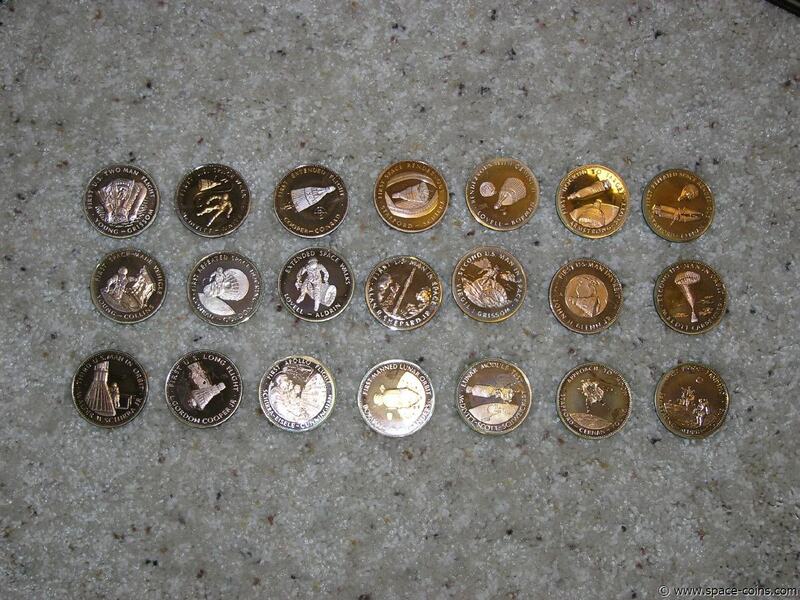 There are two identical coins. 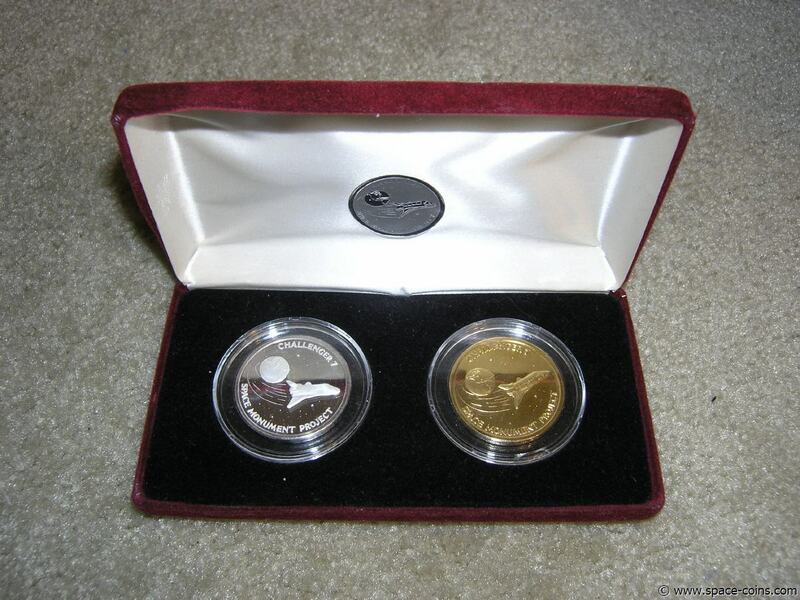 One is .999 fine silver, the other one is .999 fine silver and gold plated. 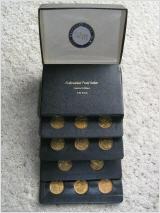 A set of 12 Silver Proof Medals. 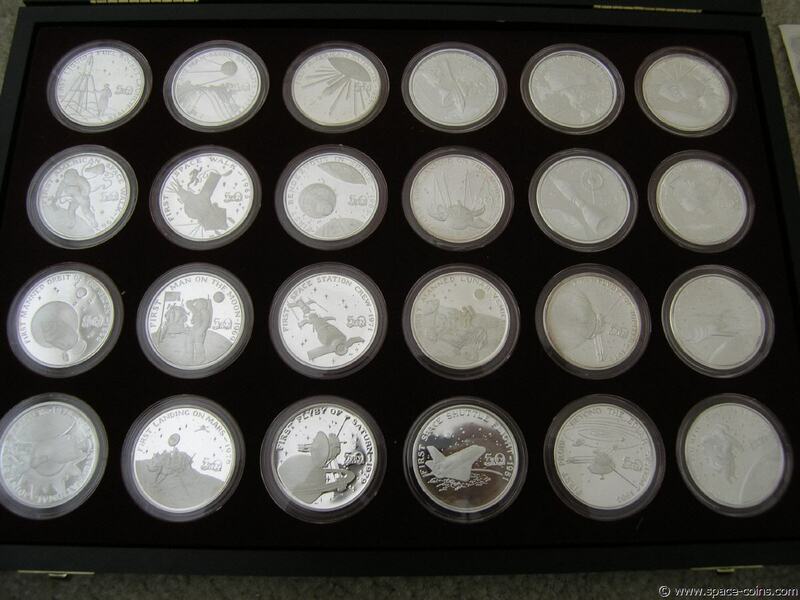 Total weight is 6.94 oz (215g) pure .999 silver together! 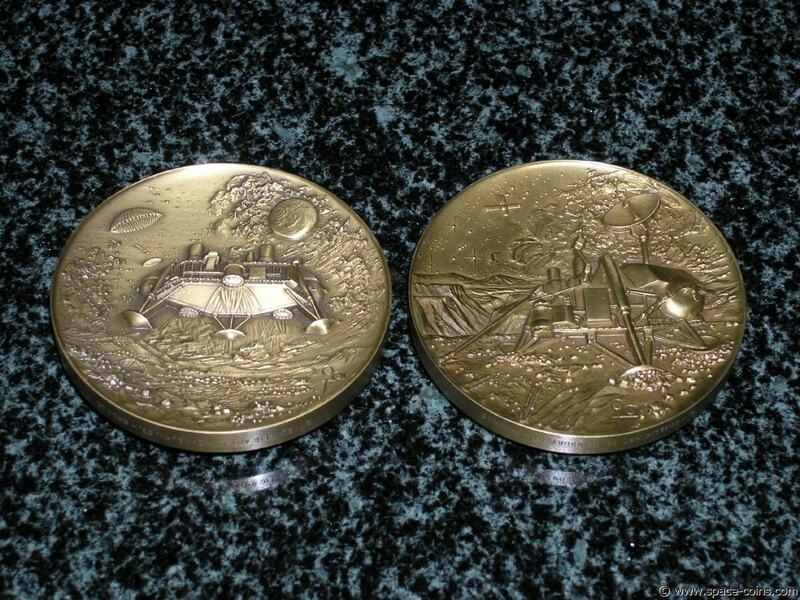 Both medals are 1 1/2 inches in diameter and in great condition! 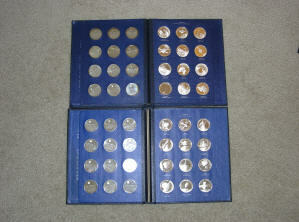 20 different colorized Space Half Dollars!! RARE!! With original COA and signed card from the designer!